Training season is in full swing at the Humphrey house. Running 4 days a week and cross-training 2 leaves me with 0 days where I’m not feeling the hunger of training. I’ve done eating while training very wrong in the past and I’m determined to get it right this time around. I’m working on my health every day, trying to reduce my risk of diabetes and keep my family healthy and happy. The challenge is to figure out how to feed four of us, not break the bank and manage to avoid the world of overly processed foods. And yowza, is it a challenge. First, a brief history of what I’ll call “Jessica’s Italian Food Problem.” Growing up in my family included eating lots of delicious meals, meals that I can still longingly recall today. My great-grandmother passed down her recipe for marinara, but only begrudgingly and when the physical work became too much for her. My grandmother did the same and now my mother and my aunt hold the secret to the sauce. This sauce is the base of my “last meal” answer. You know the question, the one where you’re asked what you would eat if you were told you were eating your last meal? I would eat this sauce with a giant loaf of the crustiest, whitest Italian bread I could find. The pasta would be a bonus, but would be unnecessary if we had to keep things simple. My family would gather for meals around my grandmother’s kitchen or dining room table and her giant pasta bowl would hold the magical mix of carbohydrates and tomato sauce that we all held our breath for. Plates would tower with homemade meatballs, pork neck bones and lasagna, all drenched in the rich marinara. Oh, and there would also be butter, cheese, bread, salad drenched in olive oil and vinegar and extra sauce in a gravy boat, just in case you needed to ladle on some extra love. Babies were given pasta, a shower curtain under their high chairs and the freedom to eat without worry if some of that sauce ended up in their hair. Seconds were encouraged, left overs went home with each of us and we all wandered sleepily through those nights, deep in carbohydrate comas. It was heaven. 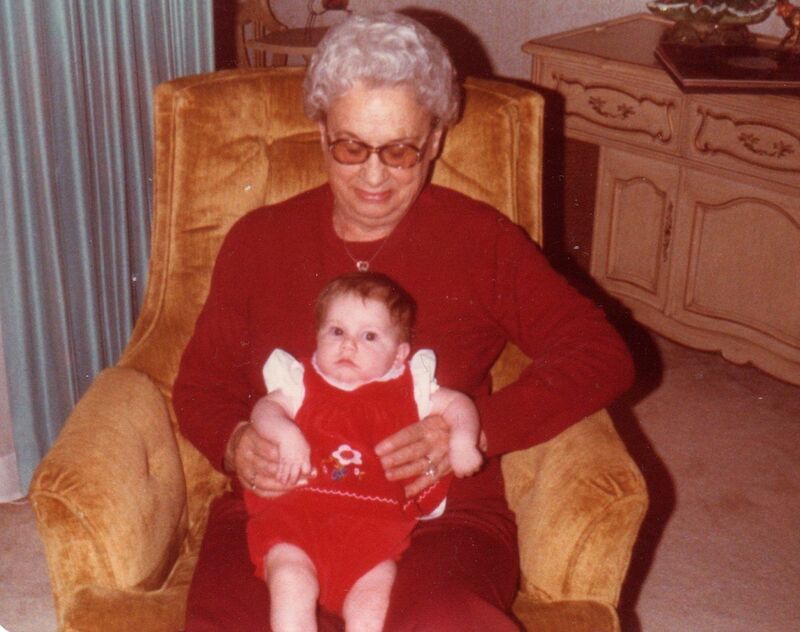 Little me and my Great-Grandma, maker of the sauce. So, why call this a “problem?” I didn’t exactly grow up learning how to roast vegetables or celebrate fiber. Which is not to say that the generations before me did anything wrong, we simply know more about the relationship between our food and our health than ever before. So, I had some learning to do. I had to learn as an adult that broccoli was not best served with Velveeta. I had to learn what glycemic index meant and why I should care about it. I watched Food, Inc. I read the Omnivore’s Dilemma by Michael Pollan (who famously boiled his eating philosophy down to 7 words: “Eat food. Not too much. Mostly plants”). I started to treat food as fuel for my running. I realized that I wanted to eat less chemicals and more real, honest-to-goodness food and that I wanted my children to grow up appreciating where their food came from. I have two resources that I’m using to help me be a better cook and a better consumer. The first is Fresh Fork Market. My family has been subscribing to this Cleveland CSA (community supported agriculture) service for three years now. Every week between May and November, I pick up a bag of locally produced vegetables, fruits, cheeses, meats and other goodies. For about $30 a bag I get about 1/3 of what my family needs to prepare healthy meals for the week. I get the benefit of knowing that these products have been locally sourced, supporting Ohio farmers and small business owners and I get the pleasure of someone else doing at least part of my meal planning for me. Trevor Clatterbuck, the founding manager of the group, puts together recipes and events that showcase Ohio farmers and their foods. Fresh Fork has made me a better cook and widened our family’s food horizons. Before subscribing, I had never cooked with things like beets, greens or parsnips. I feel like I learn something new from every bag we pick up. My second resource is new to me, but I already love it. My friend, and fellow runner-blogger, Mike recommended a meal planning site on his blog recently. The Fresh 20 is a meal planning service for busy families, started by a working mother of two. Each week, for a nominal fee, subscribers are emailed a shopping list and corresponding recipes for 5 easy week night meals. The bonus? The meals are based on seasonal foods, which dovetails nicely with my Fresh Fork subscription. You are given a prep list of items to prepare in advance (which took me less than 1 hour for 5 meals), along with recipes that should take less than 30 minutes to prepare. Though we are new subscribers, we’ve already devoured the first two meals on this week’s list and I can’t wait to cook more. So, that’s how I’m trying to feed a home that includes two growing kiddos, a busy husband and a hungry marathoner. Do you eat locally? How do you handle cooking during training season? I’d love to hear your suggestions! Thank you……I love you and this story.